Pictured: The gafotozi exhibit at Love 4 Life, a youth arts event held by A Peace of Life in Kacyiru (Rwanda) as part of World AIDS Day 2010. Two of the photo essays focus on the personal impact of HIV and AIDS. They were created by 5 youth who participated in our first photography workshop in 2009 which resulted in the founding of Gafotozi by Johnny CY Lam, documentary photojournalist affiliated with A Peace of Life. In December 2011, we returned to the same village where we held the first workshop and stayed with one of our gafotozi families most impacted by HIV. One morning, Johnny shot an incredible series of photos on the waking moments of the family – where mom and two of her children must take antiretroviral medication to remain alive and well. 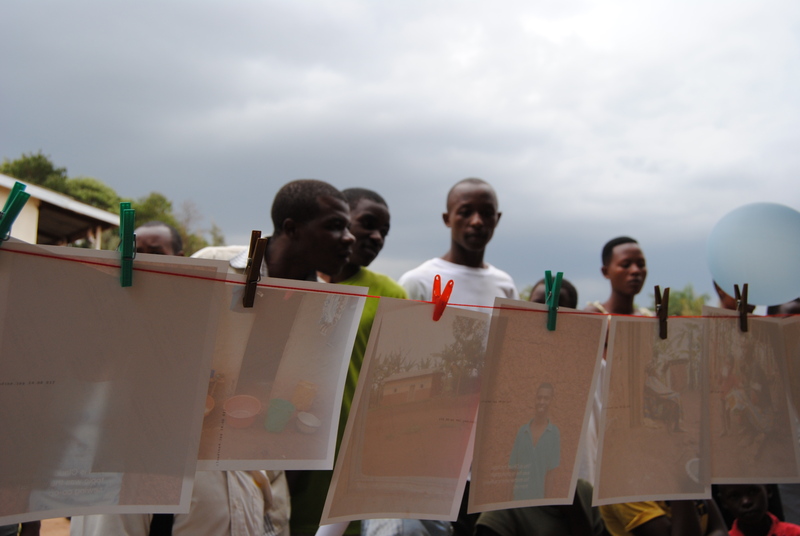 The resulting photos became a powerful and moving photo essay by Johnny called 13: Living with HIV in Rwanda. The first 13 minutes of each day. On March 16-29, 2012, his remarkable exhibit, along with photos from the gafotozi, will be on display at The Department, 1389 Dundas St. W., Toronto. Plan to attend. Contact us for more info. As part of this special event, A Peace of Life will present short films by young filmmakers of Almond Tree Films Rwanda which show another challenge facing youth in Rwanda today – coping with the legacy left by the 1994 Tutsi Genocide which nearly destroyed their country. While much progress has been made over the years, trauma, mistrust and fear linger. These young filmmakers share stories of the pain, hope, love and courage behind peace and reconciliation. We also look forward to some surprise guests! 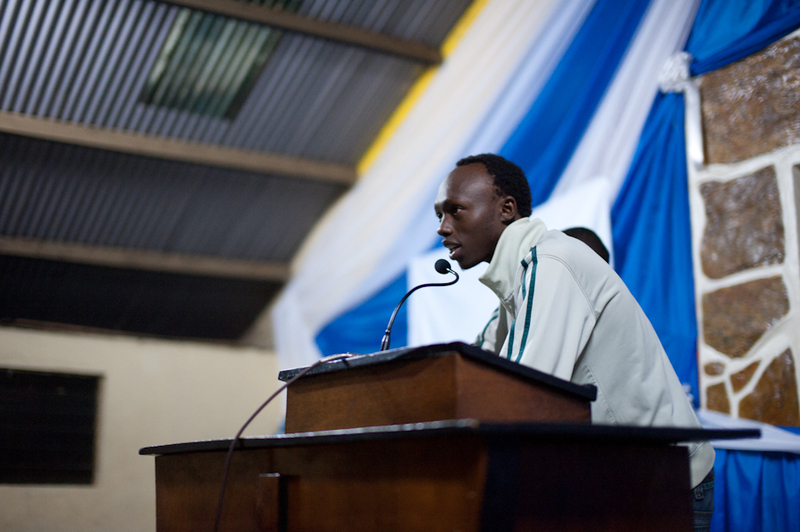 Pictured: Yves Montand, one of the young filmmakers of Almond Tree Films Rwanda, introduces the short film, Tears of Hope, at the opening of Peace Camp 2011. This film was produced from a script written – and acted – by youth who attended Peace Camp 2010. 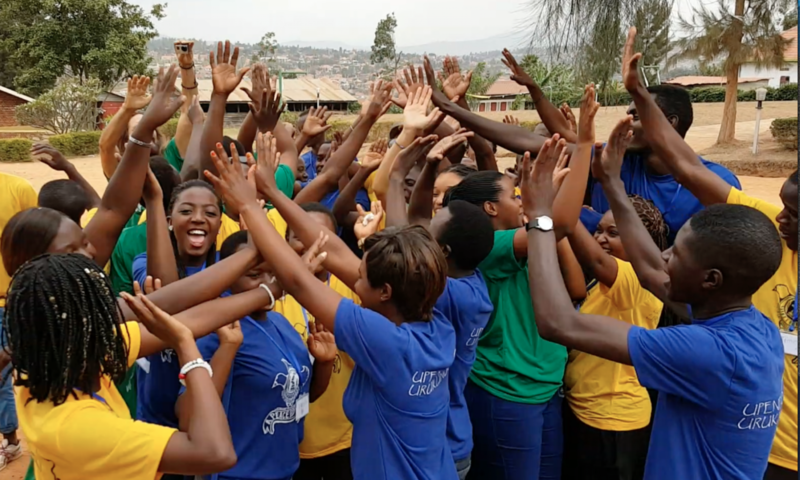 For the past two years, Almond Tree Films Rwanda has trained youth in filmmaking as part of the annual peace camps offered by A Peace of Life in partnership with AEBR Youth. More news to be posted shortly on Peace Camp 2012!